3 years ago today I was asked a question that would change my life forever. Back to that beautiful day at the cabin. We were planning to go on a siteseeing tour of the Thousand Islands- Millionaire’s Row to be exact. So off we went. It was absolutely gorgeous! We took a boat tour that weaved us through the clusters of small islands. We were able to see the stunning old mansions that were each set on their own little private islands. Breathtaking. The last stop was at Boldt Castle: where were were let off the boat to go walk around the grounds and through the Castle itself. 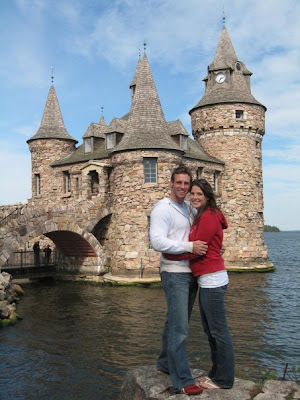 Boldt Castle is nestled on a heart shaped island (Hart Island). George Boldt had built the castle for his beloved wife, but tragedy struck and she died before he could finish it completely: You can read the whole story here. It’s a stunning castle that has hearts engraved everwhere. Anyhow, we were walking around and I was following Mike around like a lost puppy when we turned the corner go up onto the 6th Floor Balcony to check out the stunning view of the River and the neighboring Islands. I looked down and saw a bunch of Rubber Ducks all in a row on the stoop of the castle window. Here’s a little Slideshow of that day, along with our actual engagement pictures! AWWWWWWWW! I love it. Glad you didn't need to find more ducks. How wonderful. Omigosh. You two are ADORABLE! I love it! Great slideshow and story with it. So thrilled it's been a wonder past 3 years for you. I wish the two of you a lifetime of happiness and joy. My fiance and I are getting married this Friday 10-15 and we couldn't be happier. WOW! The two of you are just TOOOO CUTE!!!!!!! !